Now that I’ve settled on a date for bringing Presto home, things are kicking into high gear. Mostly because that date is less than 2 weeks away and I have a lot of other things going on in that time period. Time is even shorter than it seems. Hoping that maybe two thick sturdy clips will be a bit more secure than an over the fence feeder or a single snap option? I dunno, maybe I’m dreaming here. I do know this thing will have to hang high enough to where he can’t get his feet in it, because I’ve seen him at work with those crazy giraffe limbs and it’s kind of impressive. In a really really naughty way. He does this a lot when he’s mad. Either way, it was only $10, so if he murders it then it’s not the end of the world. And because of that habit of flinging his food on the ground, I picked up a tub of Sand Clear. We have a lot more ground cover here than where Presto lives now (and our horses eat their grain meals in stalls), so horses ingesting sand isn’t as much of a problem, but I definitely want to run a round of this stuff through Presto when he gets here. He’s already had some there in the past, but let’s start off a new place with a clean slate. He also got a fly mask, arab/cob size, which will hopefully fit. It was cheap, so when he inevitably destroys it or removes it and stomps it to death, I won’t be that sad. Do we see a theme here with the things I’m buying for the baby horse? I got a fairly unattractive tan one though, working off of the well-known rule that the uglier a “barn supplies” item is, the longer it will last. We’ll see if that holds true against the whirling dervish of destruction that is Presto. I also realized that I will need a lot of things in sets of two now. Like… I need two hay nets for the trailer. I need double the amount of salt blocks and fly spray and fungus stuff. Somehow this hadn’t occurred to me yet until I tossed that $3.88 clearance hay net into my cart. Then I had to sit here for a while and think about what all else I would suddenly need two of. I’m 100% certain I haven’t thought of it all yet. I definitely need more fungus spray. We also sat down and looked at the feed options and what made the most sense. Due to supply issues and the barn’s bulk pricing, it’s easiest and cheapest to get Triple Crown Growth. So we’ll do that and see how it goes. I’m planning on supplementing with Equipride, alfalfa pellets, and a little oil, at least for a while until he’s filled out a bit. I don’t want him fat, he’s a baby, but he’s super growthy right now and looks like he could use the calories. We’ll start there and see how it works out. I’ll let the barn guys feed him the TC/Equipride and I’ll do the alfalfa pellets/oil when I’m there so that I can soak them, easily tailor the amount, and bribe him into loving me. The barn owner and I also plotted out a good area for a high tie. There aren’t really any trees that are in a good spot for a Patience Tree, but we sure can sling up a high tie with an inner tube in the arena. She has a horse in for training that would benefit from it, and Presto certainly needs to spend time on it, so it’s in process. The main barn worker also said I could borrow his roping saddle to put on Henry for those first few ponying experiences for Presto. Muahahahaha on so many levels. The alfalfa pellets are already purchased and sitting in my garage, the Equipride is in my guest room, and the TC is on order. The box of barn stuff is already in it’s spot in the tack room (oh hey, other boarders, sorry that I take up literally 1/5 of the tack room on my own). I hesitate to say that we’re definitely prepared, because I’m sure that there are approximately a hundred other things I’m forgetting. But… at least maybe we’re off to a good start? So excited for that monster to come home. I cant wait for all the blogging 🙂 this is going to be fun! Is he going to be out most of the time and just brought up to be fed?? Yeah that’s how all the stall horses at the barn are. They just come in to eat, or if it’s under 40/over 95, or raining. Unless you’re Henry, then you come in when it’s over 85 because delicate flower. A year from now you are going to own more horse clothing than you thought humanly possible. Between Texas “seasons”, growing baby, destructiveness and other random reasons you’ll have to devote a room in your house to horse blankets. At least that is how I feel! My horses require infinitely more clothing in Texas than they did in Montana. It’ll be SO fun having Presto here, though. I’m excited for you! I already own way too much horse clothing LOL. It’s all in size 78-80 though… no idea what size Presto will be wearing by next year but it won’t be that. He’ll probably just get one blanket next year, and it’ll be whatever is cheapest that kinda sorta fits. He’s got “BLANKET SHREDDER” written all over him. What better way to break the baby tornado’s spirit than to drag him around attached to Henry? Someone’s spirit will be broken…let’s just hope it is Presto’s! Squeeee!!!! So excited! Sounds like you have things covered at least for the beginning. I had the opposite issue once Romey moved out. I was still buying things in threes for a bit. Oops. My old horse Cosmo got his foot stuck in the feed tub once. We were at a show and he was trying to intimidate his neighbor by rearing at him. (It was a pony btw…) And he landed with one foot in his feed tub. He was definitely embarrassed and stood in shame so I could cut him down. So glad it was a horse show stall, and the bucket was attached with zip ties, or that would have been a much more difficult ordeal. At least you’re starting with a baby… that’s not being ridden yet. I can’t imagine how crazy it might be to be a pro tack ho with 2 eventing horses… that’s like 6 times the stuff! God, can’t nobody afford that (even though he does technically already have a bridle waiting for him). I dunno how people do it. Can Uncle Henny live up to Uncle Skeeter? Probably not. He’s far too Henny. Vet wrap, duct tape and baling twine. You can pretty much bind, fix or repair most anything a young horse destroys – including itself – with either, or a combination of those things. On second thought, you might want to double or triple up on that vet wrap and duct tape since Henry may be an enabler. Can’t wait for frequent Presto updates! Wow, the next new era of your life! My last horse was the ultimate destroyer of feeders. I don’t know how he thought he was supposed to get his feed, because every type and arrangement anyone could think of was tried on him, and he killed them all. The only thing that worked was a very large black rubber tub, with or without his 2-3 flakes of hay in there as well. He was eating with his head close to the ground, had plenty of room for his head so he didn’t feel the need to attack the sides, and the feed couldn’t jump out. If a barn insisted on a feeder, the large hard-plastic buckets bolted to the corner, or any kind of hard-fastened manger lasted better than a feeder or bucket hung loose. But he was violent with those as well and his feed went everywhere. For a while one barn owner tried feeding him from a flat rubber pan-type feeder on the ground. He grabbed it with his teeth and flung it places, with or without feed. It often landed outside the stall. In between feedings he used it for a chew toy and for tossing practice. That barn owner tied it to the fence panels that were the side of his stall, and so then he took it apart with his teeth. This… did not stop me from buying him three halters and his own grooming set, I’d like to add. 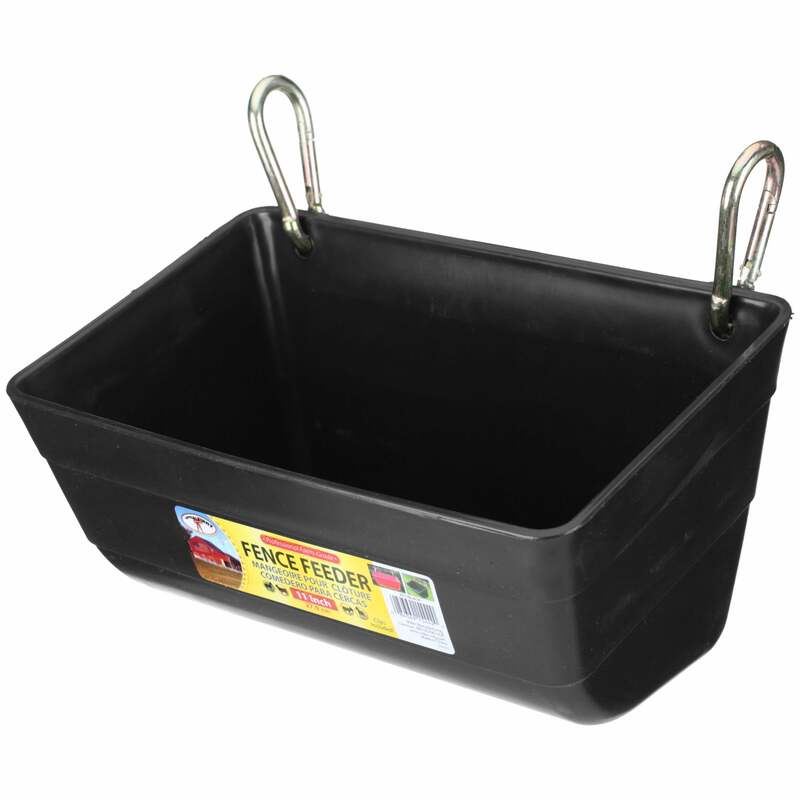 Get a extra large feed tub – sometimes called a mixing tub, and put it on the ground. He can spread the feed out and push it around with his nose. Most will stay in the tub instead of ending up on the floor. But he’s probably going to destroy the bucket. You’ll be buying a new one every month.